Location: Africa, Europe, India, China, and Western U.S. 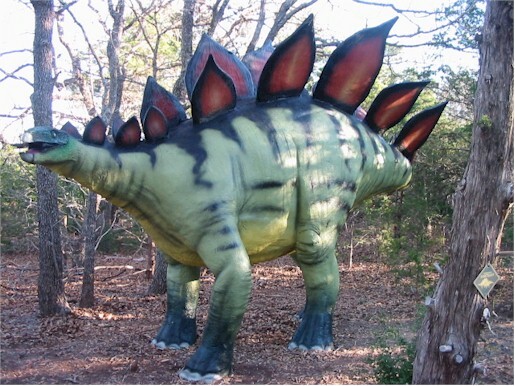 Easily one of the best known of all the dinosaurs, Stegosaurus is recognized the world over. The unique plates along its back, its small head and spiked tail make it a peculiar and unique dinosaur. The long fearsome spikes on its tail would have made a powerful weapon against predators. Stegosaurus is often called the dumbest dinosaur because of its incredibly small brain. In fact, most scientists believe that its brain was too small to control such a large creature and that it used an auxiliary "brain" located above its rear legs to help control its movements. This was not actually a brain, but a bundle of nerves twenty times larger than the walnut-sized brain in its skull. Most fascinating to people are the plates along its back. There has been a great deal of debate about their use and arrangement. The plates were made of bone, but were filled with tube-like tunnels and were probably well nourished by blood vessels. The most prevalent theory is that they were used for cooling or heating the animal. A more recent theory, however, suggests that they could have been used as a display during courtship and that they may have been brightly colored. It is also possible that they could move up and down, perhaps to intimidate predators.